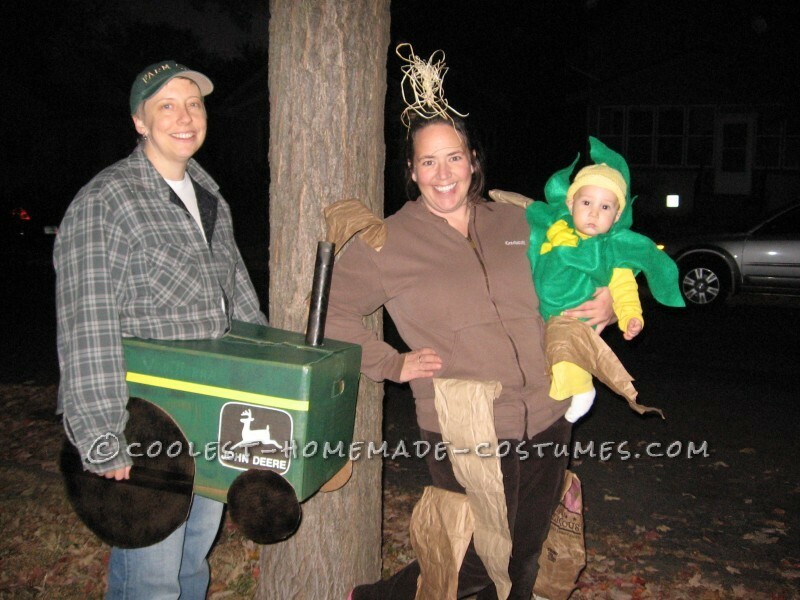 Cool Family Costume Celebrates Iowa Corn! Cool Homemade Halloween Costume: Skinned Alive! I love Halloween and was thrilled to celebrate my daughter’s first Halloween in grand fashion, and celebrate our first Halloween as a family of three with an ensemble. I love sweet corn even more than I love Halloween. As an Iowa native living in Minnesota, I’m known for being an absolute sweet corn snob. Most years we make my parents’ annual corn feed, which is scheduled at the last minute during that single, magical week in early August when the corn is perfect. If we can’t make it we schedule a “border run” to meet my folks at the Iowa border for coolers full of just-picked-this-morning sweet corn. My daughter was born in 2011, and I felt a deep obligation to begin her training in the finer ways of being a sweet corn fanatic. 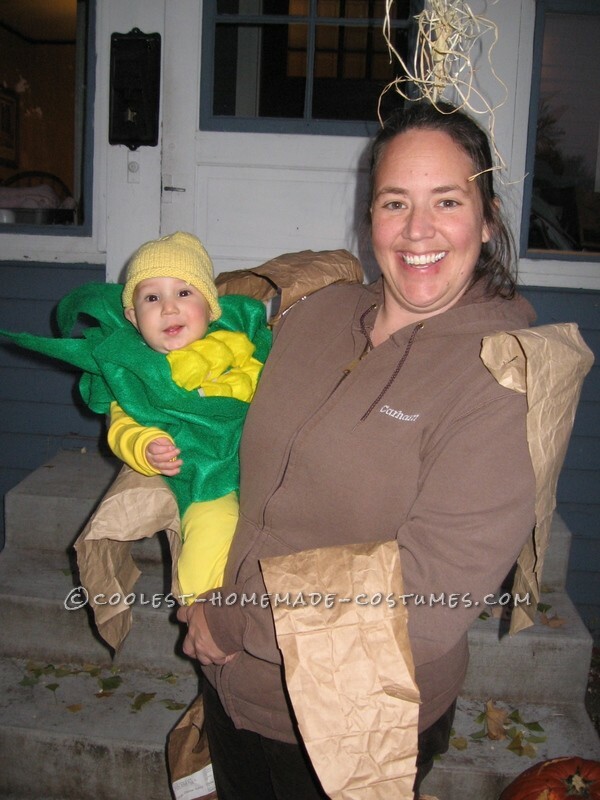 The idea for this Halloween costume started as I worked on a “touch and feel” book for her, which included this sweet corn page. I cut the green felt by free handed to make the corn shucks. Actually, I struggled with this for days, trying to make a template out of a brown paper bag and doing several “fittings” with my daughter. That was not appreciated by my 9 month old so I gave up and decided to wing it. I had hoped for something cleaner and more form fitting, but actually the looseness gave her a lot of room to move. I used several layers—planning for a true chilly Minnesota Halloween night. I sewed the front and back shucks together at the shoulders for “arms ” to keep it on her. My niece had knitted this cute yellow hat that, along with a yellow onesie and yellow pants, provide the perfect “cob” base. I cut and painted sections from egg cartons and attached them to a piece of green felt (something my mother used to call a “Dickie”) for the kernels. I attached this piece to the green shucks via a few pieces of Velcro to help hold it all together. Happier than two peas in a pod. As any new breastfeeding mama can tell you, the first months you feel attached to your new baby. Literally. Really attached. That, along with my unchecked competitive desire to win my office Halloween contest, inspired me to create a costume that linked us. 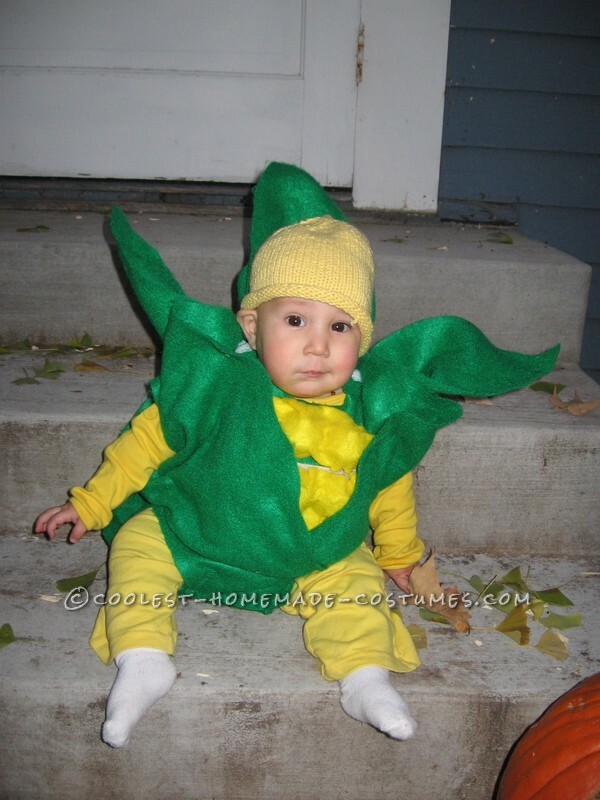 Ta da….the corn stalk. I wore a brown sweatshirt (appropriately a Carhartt) and attached brown paper leaves (leftover from my failed attempt at a cob pattern). My partner suggested more leaves would have made it better. In hindsight I agree (although I didn’t appreciate the feedback the night before when I was still working on my costume well into the evening.) For the corn tassel, I attached raffia to a chopstick and stuck it in my ponytail. We did win the work contest, despite protests that using a 9-month old baby as a prop is an unfair advantage. The tractor is perhaps the most impressive of the three, and it was also the easiest. Here’s what we did: A cardboard box with a rounded cut out for the front of her body. A strap threaded through that fastens around her waist like a belt. Green spray paint. Downloaded logo. Black spray paint for the wheels. A little duct tape for assembly. Paper towel tube spray-painted black and attached via a cut out hole on top for the exhaust pipe. Some reflector tape for detailing. 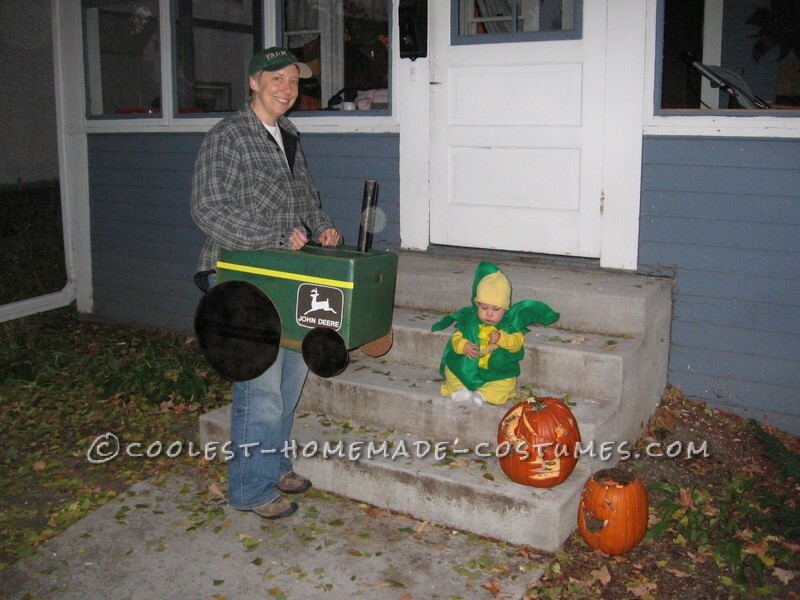 Flannel shirt and Farm Girl cap complete the outfit….and the family ensemble.